Recently, I was chatting with a friend of mine about the petrol situation in Berowra. As she pointed out to me, four petrol stations could be seen as slightly excessive for a community like ours ‘if it weren’t for the express way – I suppose people come to Berowra on their way north to get petrol’. 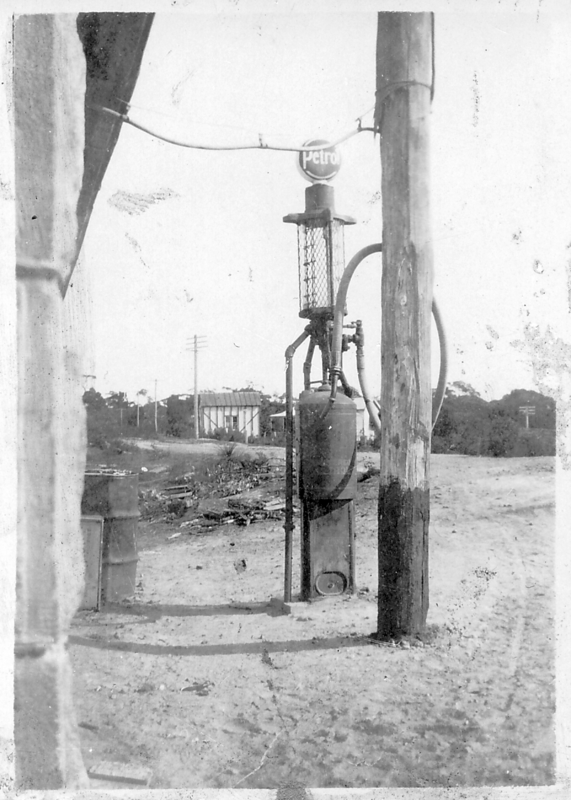 The conversation put me in mind of this photo, showing Berowra’s first petrol station, outside Fosters Store on the Old Pacific Highway. There was a certain charm to the little petrol pump – Berowra’s modern petrol stations aren’t quite the same are they! What a wonderful old photo. as well as showing the old bowser,in the back ground can be seen Fosters “cottage”as it was called ,at the corner of Pacific Highway and Berowra Waters Road, with the garage at the rear It was in this garage,( courtesy of Mrs Foster.) after making it longer to facilitate the extra length, that the first Berowra fire fighting vehicle, an ex army ambulance as shown in one of Jim Hatfield`s photos, was housed. Bill Gainsford was equipment officer at the time. A little bit of trivier.